It runs under a custom control system, which does dark subtraction, flat-fielding and object detection on frames taken. The system operates over a fixed set of exposure lengths from 50ms to 10s. The guide window is nominally 100x100 pixels, and guide centroids are sent to the Telescope Control System which applies the correction accordingly. You do not need to pick your own guide star. As we have only one autoguider, only translational tracking errors are corrected, rotational errors are not. The enclosure is a novel clamshell design, consisting of two shutters, each comprising three separate portals. 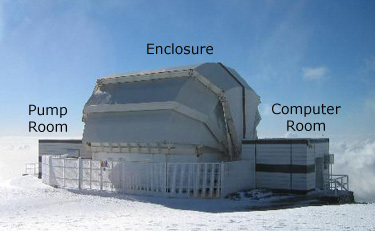 To open the shutters, two hydraulic rams at either end of the enclosure retract, allowing the top portals to move down and the other two sets of portals follow dynamically. When the enclosure is fully open, the telescope has an unencumbered view of the sky to an optical horizon of 25° altitude, its mechanical horizon being 20°. Fully opening the enclosure takes approximately three minutes. The entire observatory structure was designed by TTL and built by Cammell-Laird in Birkenhead, the famous shipbuilding company in Merseyside, UK. The hydraulic ram system was designed and built by Hydraulsyd (now PMC Hydraulics) of Sweden. 28° 45' 44.8" 17° 52' 45.2" 342° 07' 14.8"
Contrary to what the name might suggest, the Liverpool Telescope is not in Liverpool at all, but on the island of La Palma, the westernmost of the Canary Islands. 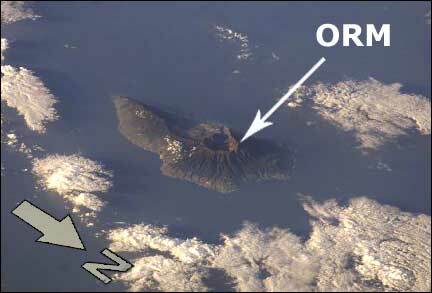 The Canaries are a group of volcanic islands 200-300 km off the northwest coast of Africa. 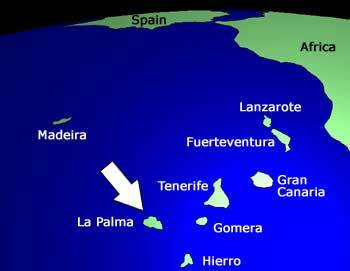 La Palma (arrowed at right) is probably the least developed of the islands in terms of tourism. This, however, is arguably a good thing, given that most of the island boasts breathtaking scenery. The most distinctive feature of the island is the enormous Caldera de Taburiente, the eroded remains of a volcano that collapsed two million years ago, leaving behind the largest caldera in the world. One point on its rim is the highest point on the island (2426m), called the Roque de Los Muchachos ("Rock of the Little Children") because of the small rock formations there. Image Science and Analysis Laboratory, NASA-Johnson Space Center. 10 Jul. 2006. "Astronaut Photography of Earth - Display Record." The Roque is one of the best observing sites in the world, and for this reason many European observatories have been built there, under the umbrella organisation of the Observatorio del Roque de Los Muchachos ("ORM").